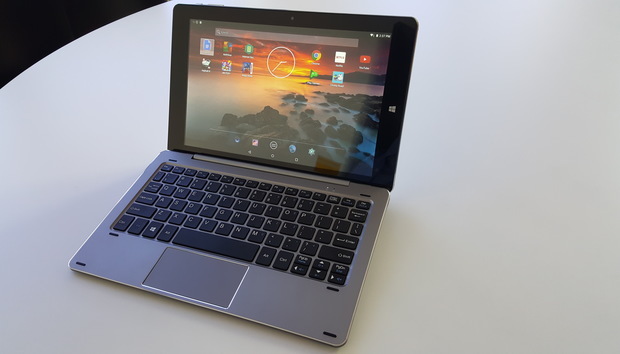 Unfortunately, while this sounds great in theory, the reality of Windows 10 and Android Lollipop rooming together inside the same Atom-powered, 10.1-inch tablet is fraught with compromises. For one, things can get cramped, unless you pay a little more for an SD card to store your apps. And although Intel’s “Cherry Trail” Atom processor might seem like it's up to the task, the numbers simply don’t bear that out: The HiBook is woefully underpowered, far slower than our crop of recent Core m convertibles. Of course, you don't get to that low price without cutting a few corners, and that includes the documentation. While the HiBook CWI514 is readily available from Amazon’s fulfillment centers, it's best suited for an experienced consumer who can figure out that what’s labeled as a “TF” card slot actually accepts microSD cards. What little documentation there is was written in poor English. Otherwise, Chuwi packages everything else well, though the charger I received for review was a 220V European one, and necessitated me hunting down an adapter plug. All told, the Chuwi HiBook's specs include a 10.1-inch, 1920x1200 screen; a 1.44GHz Atom X5 Cherry Trail Z8300 chip; 4GB of DDR3L memory; 64GB of eMMC storage; and 802.11b/g/n Wi-Fi. There’s a Micro HDMI cable output and a 128GB SD card slot, but no WWAN option. The tablet also includes a 5MP rear camera as well as a 2MP front camera. In use, I'd rate the HiBook’s keyboard as slightly below average, due to a definite lack of resilience and slightly disappointing key travel. The Enter key is a bit small (and the Ctrl and Alt keys surprisingly large), but otherwise things are organized as you’d expect. Finally, be aware that though Chuwi touts the HiBook as a “one glass solution," it’s actually not. As the company admits in the Q&A on its Amazon page, there is indeed a slight gap between the glass and the digitizer, making it a poor choice for stylus work—not that it ships with one, however. Chuwi’s choice of a poky Atom chip certainly contributes to the HiBook's limitations, but I think the 64GB eMMC drive is as bad, if not worse, for performance than even the CPU. It’s not unusual for phones and some tablets to be built around eMMC technology, which is essentially a flash card plus controller logic built onto the same die. Most of the tablets we’ve recently tested though use full-fledged SSDs, and the read/write tests that we ran using the CrystalDisk benchmark reveal the stark differences. Though we’ve compared the HiBook against a number of convertible tablets, the most apt competitor is the Microsoft Surface 3, Microsoft's own an Atom-based tablet. While not an exact analogue, Microsoft's closest Surface 3 model comes with 2GB RAM, a 64GB SSD, and a slightly more powerful Atom x7-Z8700 processor for $499. As our tests prove, the HiBook is slightly better than the Surface 3 in read/write performance from the embedded flash—but this is the only category where it wins. There’s a clear hierarchy ranging from the basic Atom-based systems, to the storage used by the Core m convertibles, to the premium Dell XPS and Surface Book 4 machines. In all, I’d rate the HiBook as an average Android tablet, coupled with a fairly poor Windows tablet experience. Reports say that Chuwi will soon release a "Pro" version, with a fully-laminated 2560 x 1600 display, but that still doesn't solve the problems I had with the tablet's performance. If Intel could commit to a long-term high-performance Atom strategy I could see the market for these types of dual-boot tablets flourishing over time. For now, however, I would buy the HiBook CWI514 only after accepting that what you'll receive is fairly limited.